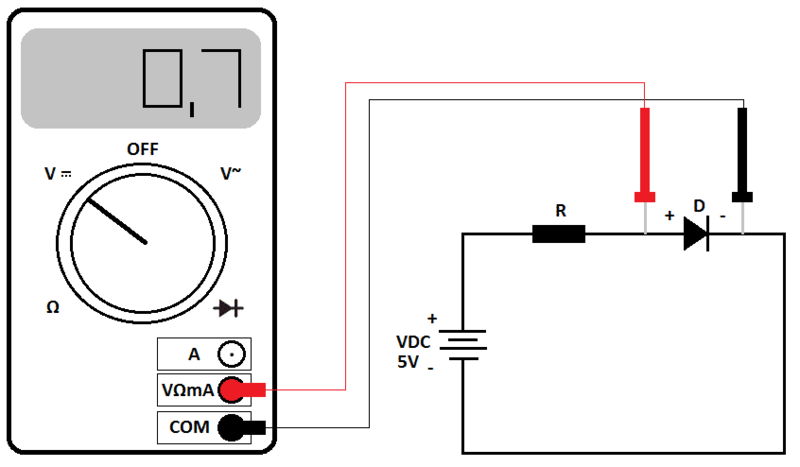 How to determine where is the anode and where is the cathode? Semiconductor diode – type of diode, which contains “p-n junction” made from differently doped semiconductor materials. 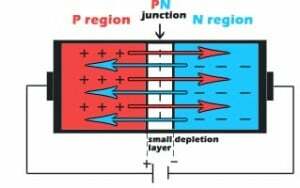 It is double-ended, nonlinear electronic component, where terminal attached to the “p” layer (+) is called anode and “n” layer (–) cathode. 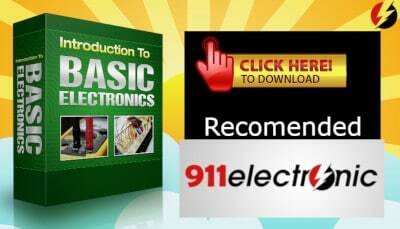 This electronic component is mainly used because of it’s ability of making electric current flow only in one direction (from anode to cathode) after forward-biasing the aforementioned “p-n junction” with the positive electric voltage. 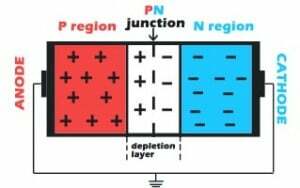 However, in the opposite direction (reverse bias of the “p-n” junction with the negative electric voltage) we can say that in ideal semiconductor diode electric current won’t flow. This is why semiconductor diode is often described as the “electric valve”, which can pass or block the flow of the electric current. 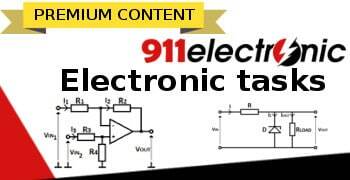 If you are a student or simply want to learn how to solve Semiconductor Diode tasks, please visit this section of our website where you can find a wide variety of electronic tasks. Semiconductor diode consists of two, differently doped semiconductor crystals – “p” and “n” types. 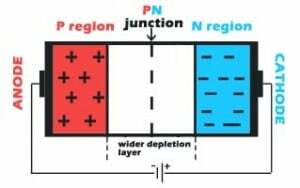 Together, they form so-called “p-n junction”, where the “n” layer (with electron donor dopants) has an excess amount of electrons, which are the majority carriers there (we have more electrons (-) than electron holes (+)). However, in the “p” layer (electron acceptor dopants) the majority carriers are electron holes (+) rather than electrons (-), so we have more holes “to fill”, than electrons available. The electron hole is a vacancy created by the electron “travelling” from its initial place to some other location in that crystal. In reality, there is no such thing as “a hole”, but that lack of electron kind of makes it a positively charged particle, which attracts negative electrons to form a pair again (holes can move too). After they combine, a proportional distribution of electrons begins. Electrons, which previously lacked in “p” layer are transferred there from “n” layer, where were too many of them. So, “n” layer is a good friend for “p” layer, right? 🙂 And this is where so-called depletion region is formed, which prevents the flow of the electric current (thermodynamic equilibrium). To allow the flow of the electric current through the “p-n junction” (electric valve on), external positive electric voltage must be applied to “push” and help large group of electrons and holes to meet together (forward bias of the diode). After they are “pushed” through the depletion region with enough force (VF = 0,7V) diode starts conducting current, so it starts to flow through it. To make sure, that the electric current won’t flow (electric valve off), it is needed to apply external negative voltage to the semiconductor diode (reverse bias) to make depletion region even larger (illustration below). With passing time, technological requirements were increasing what resulted in development of new types of diodes. When a semiconductor is combined with the corresponding metal, we acquire MS junction (Metal-Semiconductor), which also possesses rectifying properties (current conduction in one direction) – it is used for example in fast Schottky diodes. MS junction properties depend mainly on the surface state of semiconductor and on the output work difference of electrons from metal and semiconductor itself. Schottky diode is mainly used in systems that require fast switching time (small junction capacitance Cj of the diode has a decisive impact) with frequencies up to several tens of GHz. The graph below shows the current-voltage characteristic of the semiconductor diode. This is a typical characteristic for semiconductor diodes used in electronics (VF = 0,7V). The semiconductor diode starts conducting current after exceeding the threshold of the forward voltage value specified by the manufacturer in the data sheet. 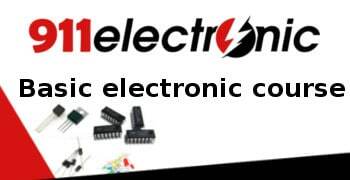 Semi-thermal diodes are mainly used to protect other electronic components. 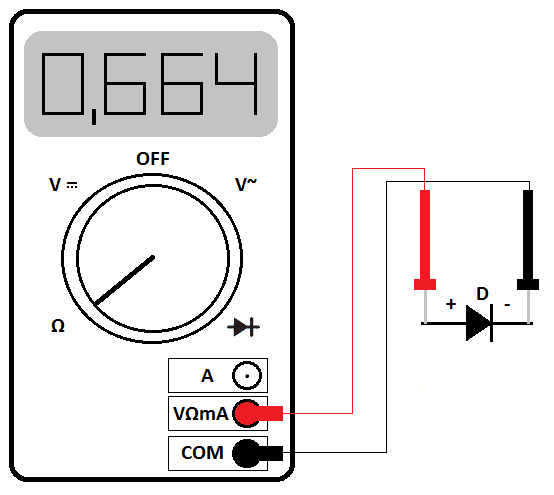 You can also use “diode check” function (diode symbol on the multimeter) but the result will be the same as the above with using ohmmeter. Gunn Diode – component used in high-frequency electronics. This experiment will allow you to visualize the principle of operation of a semiconductor diode, whether current conducts or not. Because you will do it by yourself, you will better remember this lesson. Below you can see pictures showing the circuit mounted on the breadboard and visualization of two opposite positions of the LED diode (reverse polarity). On the first picture, the LED was put into conducting state. Voltage potential at the anode was higher (+) than at the cathode (-), so the flow of the current was possible. In our experiment we used the 9V battery, so the current flowing through the diode will be about 9mA (calculated from the Ohm’s law). On the second picture, the diode was inserted in the opposite way (the voltage potential at the cathode was higher (+) than at the anode (-)), so the diode was behaving like the closed electric valve, which prevented the flow of the current – LED isn’t lit. Hey, thanks for the truly amazing post. I feel a lot smarter after reading this :).